Spielberg's Ready Player One builds on more than just nostalgia. Do not ask for whom Ernest Cline's Ready Player One was written; it was written for me. Or if not for me specifically, for someone so like me—a Gen X-er who came of age with 1980s American popular culture—that fine distinctions become irrelevant. Cline's novel—about a dystopian future of the year 2045 and its omnipresent virtual-reality world in which people spend most of their time controling that universe after the death of its creator—immersed readers in the minutiae of movies, television, pop music, video games, comic books and more to such a degree that virtually nothing else mattered aside from the litany of references. It was like if someone stapled together the answer sheets from an '80s-themed pub quiz and managed to convince a publisher to give him an advance for it. Thus, the prospect of a film version of Ready Player One should have been deeply concerning—except that it would be directed by Steven Spielberg. And if the director of Jaws and two Jurassic Park features has proven anything over 40 years of filmmaking, it's that he understands how to take a badly-written book and find the stuff of visually-satisfying adventure. The armature of Cline's book is still basically in place, focusing on an 18-year-old named Wade Watts (Tye Sheridan) who is one of many participating in the worldwide contest to find three keys that lead to an "Easter egg" hidden in the virtual world of the Oasis by creator James Halladay (Mark Rylance). 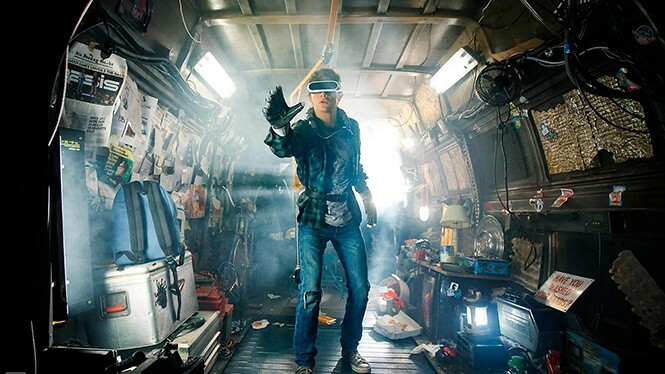 As his virtual avatar Parzival, Wade pits his encyclopedic knowledge of pop-culture trivia against other individual players like Art3mis (Olivia Cooke), and the evil IOI corporation led by Nolan Sorrento (Ben Mendelsohn), which is trying to win control of the Oasis so that he can monetize it. It's basically Willy Wonka and the Chocolate Factory built around weapons-grade nostalgia. One of the most frustrating elements of Cline's book was how little he seemed to care about the real world of 2045, and the conditions that would inspire people to want to escape it into an anything-goes fantasy world. The film—with a screenplay credited to Cline and Zak Penn—does a better job of giving the story's reality some significance, including shifting the reveal of the real-world identities of Wade's online friends to much earlier in the story. There's a bit of a moral for our perpetually-connected society, and it's a relief to realize that this incarnation of Ready Player One isn't going to be entirely about its name-dropping. That's not to say that the movie doesn't drop a whole lot of names, expanding the chronological scope from 1970s Saturday Night Fever to 1990s The Iron Giant. The soundtrack bubbles over with chestnuts from Blondie, Van Halen, New Order and Twisted Sister; one entire central sequence becomes an extended homage to Stanley Kubrick's The Shining. And the action sequences turn into the equivalent of a Where's Waldo page where the central activity practically disappears as you scan the edges of the frame so you can spot a ninja turtle, or Batgirl, or whatever else Spielberg managed to secure the rights to use. While these details begin to grow overwhelming in their ubiquity, it's certainly more engaging to deal with the checklist of references in visual form, rather than hundreds of pages of text. Most of all, there's the presence of Spielberg behind the camera, diving into fully digital realms like he did in Tintin with a similar reckless energy. Not many directors could make an anarchic auto race sequence or the climactic battle feel like a kid at play, throwing every action figure he owns into the fray. He turns the zero-gravity dance floor of an Oasis night club into a physics-defying ballet, and even finds room for Mendelsohn to offer a turn on corporate villainy arrogant enough to leave his password on a Post-it note in his virtual chair. The wearying prose of the book, attempting to turn a VH1 I Love the '80s episode into a science-fiction procedural, finds its real home on the big screen, thanks to a director who understands that the pop art we all fell in love with was based on creative spark, not just being old enough to nod at an Excalibur quote.